lem, but in the US we not only have the egg, but the chicken and the henhouse too. As a curiosity, the LNG fuelled ferry op- erating between Buenos Aires and Montevideo is the worlds´ fastest commercial ship at over 58 knots (classed by DNV GL), and I think this is a good indication also of how fast we will see a change in this fi eld. The growing number of large LNG ready ships currently being built is also evidence of this. Sea. For deep-sea shipping we believe that some routes be- tween Asia, North America and the North Sea area will have the infrastructure in all ends to support bigger ships. With the infrastructure set to be widely available in 2025, we are al- ready seeing a rush of investments to strengthen this trend. LNG as fuel and for good reason. But while it is true to say we are past the initial tipping point, there is still a need for owners to be realistic about the decision to use LNG and the practicalities, once that decision is made. Certainly there is a drive to adopt LNG for reasons of regulatory compliance, pri- marily in the current ECAs to meet upcoming limits for SOx and NOx and this will radiate out as new ECAs are adopted. 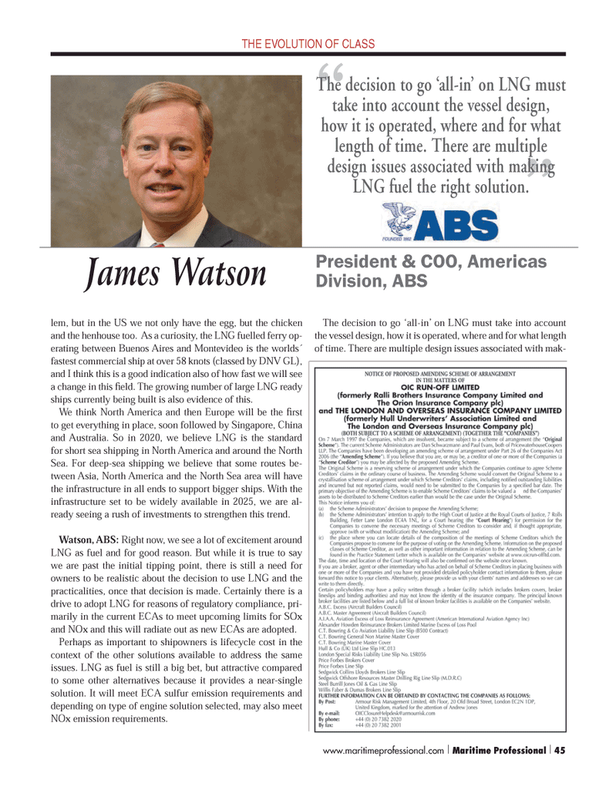 LNG fuel the right solution.